Award-Winning Garage Door Stop Seals by Advanced Plastic Corp.
We designed our side jamb and garage door stop seals for performance and door protection. Our superior side jam seals are tough, durable, and effective in all climates. Our award-winning garage door stop seals feature a hollow design, allowing for maximum airflow to reduce excessive heat buildup while eliminating twisting, deforming and fading. These garage door stop seals are pre-punched for uniform nail setting and placement assistance, further helping to eliminate warping or distortion. 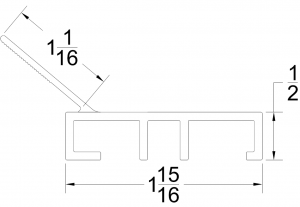 One-piece design — Our door jamb seals are one-piece, co-extruded, dual durometer units. 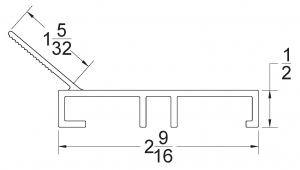 Top-mounted flap — The top-mounted flap is ribbed for a secure and reliable side jamb seal. 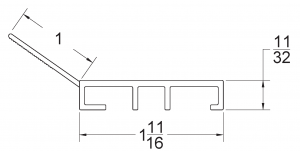 Various widths — These door stop seals are available in widths of 1-3/4”, 2” and 2-5/8”. Color choices — Up to 10 common industry colors are offered. Matching ring shank nails — Matching painted multi-purpose ring shank nails are available. Our garage door stop seals outperform the competition. Browse our selection below or contact us at 847-674-2070 for assistance. Additional colors available with minimum purchase and extended lead time. *Black available in 7′, 8′, 9′, 16′ and 18′ only. *Black available in 9′, 16′ and 18′ only. Always have just the right length of door stop with Advanced Plastic’s patented, cut-to-length Rolled Door Stop. Our flexible rolled door stop easily installs on straight, gothic, and arched openings and jambs. Durable and proven, our dual durometer, co-extruded PVC rolled jamb seal cuts quickly and easily. Convenience — Each roll is dispensed from a UPS-friendly dispenser box with a measuring scale embossed on the back of the seal. Versatility — Offered in widths of 2” and 2-5/8”, our rolled door stops come in ten common industry colors. Value — Packaged in 150’ roll lengths. Simplicity — simplify your inventory and reduce storage space while having exactly the right door jamb seal to complete your installations. Browse our rolled door stop selection below or contact us at 847-674-2070 for assistance. 5″ nail spacing recommended for best performance. * Indicates a non-stock color. Minimum purchase required with extended lead time.